Since inflation has pushed the 99 with a flake up to almost £2 and counting, buying ice cream from the van window hasn’t been quite the same. So this summer, why not make it yourself instead with one of the greatest kitchen gadgets invented: the ice cream maker. The best models let you make creamy, smooth, moreish frozen treats with the maximum ease – easier than braving the queue at the kiosk on the hottest day of the year, certainly – all with the peace of mind that comes from knowing exactly what’s gone into your cone. If you’re serious about sorbet and fanatical about frozen yogurt, the best ice cream maker 2018 has to offer is the Heston Blumenthal Sage Smart Scoop. While all of the ice cream machines on our list offer provision for more than one kind of frozen dessert, this one is unbeatable in its variety, with 12 hardness pre-sets and manual settings for an ice cream that’s tailored down to the last detail. However, if you can’t in all good conscience drop over £200 on a home ice cream maker, there are great budget options too. Try the Judge Ice Cream Maker for a versatile and easy-to-use option that comes in at a cool £40. You don’t have to be Willy Wonka himself to make the most out of a Heston Blumenthal ice cream maker, although if you really want to make the chef’s Egg and Bacon Ice Cream, there’s nothing to stop you. With 12 hardness settings, the possibilities are practically endless, allowing you to create sorbets, gelatos, frozen yoghurt and ice cream with either the simple-to-use presets or, if you’re feeling brave, manual settings for total control over your final product. The pre-cool function allows the generous one-litre bowl to get down to 30℃ to give you a good head start, but best of all, it plays an ice cream van tune when your concoction is ready. Worth every penny. If you’re whipping up frozen treats for a hungry crowd, this Cuisinart Gelato and Ice Cream Maker may fit the bill perfectly. With a very ample 1.5-litre bowl, it’s our best ice cream maker for parties, as it churns ice cream, sorbet, gelato or frozen yogurt in as little as 40 minutes. The professional compressor system also means that there’s no need to pre-freeze or wait between batches, giving you the double benefits of a quick start and the ability to keep up with the inevitable demand. But speed doesn’t mean skimping on quality, and the two separate paddles for gelato and ice cream are engineered to get the ideal amount of air in for perfect texture. This Magimix ice cream maker incorporates a built-in freezer, which means no pre-freezing, which means you can get started straight away. With an equally generous capacity as our previous Cuisinart pick, and an even more impressive operation time – when you can make ice cream in as little as 20 minutes, or around 30 minutes for sorbet, there’s hardly any point nipping to the shops – it’s a real contender for best party guest. Expert testers at Good Housekeeping said it was very simple to use and coped well with add-ins like chocolate chips, but that it was quite noisy, so it’s up to you whether that’s a deal-breaker or not. 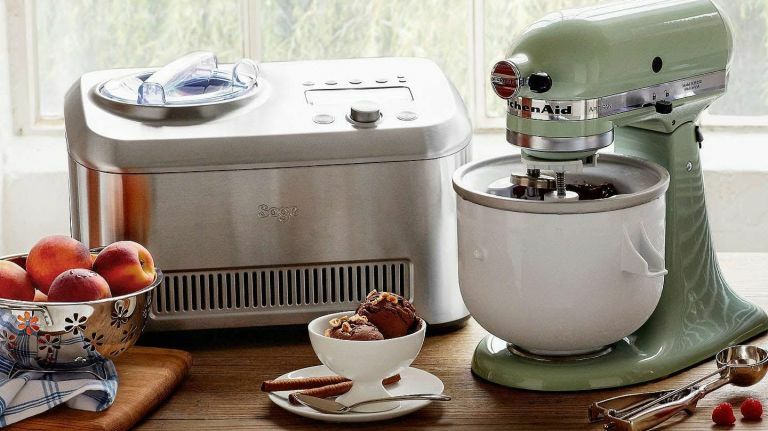 If you’re an ultra-creative chef hell-bent on making endless prototypes, the Sage ice cream maker is sure to be your best bet, but if you’d rather have ice cream, sorbet or frozen yoghurt at the touch of a button, it may well be this model from Judge. The fully automatic one-touch operation is designed to make delicious homemade ice cream foolproof, and what’s more, it’s a bargain at under £40, a long way from the £200+ price points of our top picks so far. Expert testers found there were some concessions to be made – the paddle could struggle a bit with thick mixtures, and you have to freeze the bowl first – but for a model that offers no barrier to getting started, it can’t be beaten. An excellent mid-range ice cream maker, this Cuisinart Deluxe Ice Cream Maker borrows some high-end features from its elder sibling, the previously reviewed Cuisinart ICE100BCU, but comes in at a much more pocket-friendly sub-£100 price. The biggest difference is the lack of a built-in freezer, so you will need to pop it in the chiller before you plan to use it, but between its fully automatic operation, more than ample two-litre capacity, impressive ease of use and cleaning, and high-end brushed design, reviewers found the preparation time to be completely worth it. While not technically an ice cream maker in its own right, this KitchenAid attachment is a must for anyone who already owns the ubiquitous stand mixer and can’t justify any more chunky gadgets out on the worktop. Second only to the Cuisinart ICE30BCU in terms of capacity, it makes 1.9 litres of ice cream or sorbet with what reviewers say is the greatest of ease. Of course, as an attachment rather than a standalone ice cream maker, it does need a few hours to chill in the freezer before you start, but users found that with a little preparation they could make some fabulously toothsome ice creams in as little as 15 minutes.